If you are a content producer, editor, or manager for your website, you have likely heard “duplicate content” before and know it can be a troublesome factor in the SEO world. After Google’s Penguin update with a heavy focus on quality content, your website and efforts can be penalized for “creat[ing] multiple pages, subdomains, or domains with substantially duplicate content." There are many instances though where duplicate paragraphs or even entire posts/articles belong in multiple places on your website or are posted to third-party sites. That’s where canonicalization, or normalizing URLs (redirecting multiple URLs to one location), is crucial to your content strategy and SEO rankings. If you aren’t familiar with coding, the rel=canonical tag may seem intimidating, but it really can be a simple solution. There are also many plug-ins available to help tag pieces of content the right way in your CMS. The tag should only be used for content where a large portion of the page’s content is on the canonical version as well. It is not necessary for pages similar in topic, unless they are close in exact wording. When you create a rel=canonical target, you should use the tag in either the <head> of the page or the HTTP header. Need more information on the topic? Check out the Google Webmaster video on the rel=canonical tag. So you want to share your content on publishing platforms like Medium, or get more exposure on LinkedIn through LinkedIn Pulse. Like most things in the SEO world, there is no clear yes or no on whether posting your content to another site hurts your SEO efforts and rankings. A LinkedIn Pulse article from Ryan Battles explores the topic as Battles, a business growth strategist and blogger, experimented to see if posting the same content on LinkedIn and Medium affected his website’s search engine rankings. Overall, his results didn’t seem to be affected negatively by sharing the same content across multiple platforms, but this is just one example. Our advice? Keep it to a minimum. If you have a big product/service release, or an important post to share, publishing content on these types of sites is a great way to get more exposure. Just don’t post to other sites often, especially if the website you post content to tends to rank higher on topics you want to rank for on search engines. Your focus should be on building your brand through your own platforms and growing from there. While publishing on multiple platforms can be a great way to broaden your reach, you shouldn’t build your brand on someone else’s “land”. Want more information? Check out Google’s support page. Want to get the full details on how to avoid SEO mistakes and build optimized web pages? 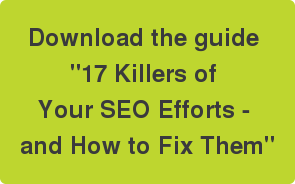 Download our web guide, 17 Killers of Your SEO Efforts - and How to Fix Them.